Once again, thanks to Jennifer at Conversion Diary for hosting this weekly carnival. I just took a load of clean laundry out of the dryer -- and promptly threw the whole thing back into the washing machine, which was already filling with soapy water, instead of putting in the dirty clothes at my feet. I fully expect to put the milk into the oven by the end of the day. I am absolutely giddy over their food; someday, I might do a post about my favorite TJ's products. But I love the store's sense of humor as much as I love their stuff. Seriously. When was the last time your grocery store made you snort coffee out your nose? Corey sent me this picture today; he snapped it outside his office window. That would be a momma goose and a papa goose and 16 (SIXTEEN!) goslings (or "yellow puff balls," as Corey calls them). We didn't even know it was possible for a goose couple to have that many babies. I Tweeted this on Wednesday, but I think it's worth sharing on the blog. "This is how you know you live in Minnesota: The neighbors have turned on their AC because the forecasted high for today is 75." That is SO TRUE. My in-laws, who are quintessential Minnesotans, start complaining about the "heat" when it gets 78. They keep their house -- winter and summer -- around 65, because that's comfortable to them. When I first started dating Corey, I had to take over an extra sweatshirt just to eat dinner at their house. Here are two pictures I took of Teyla in the last 24 hours. Between the two of them, they perfectly capture the cuteness and curiosity that is Teyla. I bought this coat at Target a few weeks ago, and I get about 10 shades of happy when I wear it. I have actually coordinated outfits to go with the coat, instead of letting the coat be an accessory to the clothes. This is unusual behavior for me. But it makes me smile, so I'm going with it. If you haven't already, don't forget to enter my Ben & Jerry's giveaway. I'm going to close comments Saturday night and announce the four winners on Sunday morning. True confessions: I have never been to a Trader Joe's. I have never even seen one live and in person. I also have never seen a store circular. On the other hand, there is a Chick Fil A just a few miles from a house. Your laundry story made me grin, I will not tell you how many times I have done that. That coat is beyond cute. Hey, 75 is WARM! That's shorts and flip flop weather! Hey, we break out the Capris and tank-tops at 55. Because she took the words right out of my fingers. BTW, CFA has new breakfast items - yogurt smoothies and yogurt parfaits. But you probably wouldn't like them one bit. Regarding Teyla reading in bed: I love baby feet. 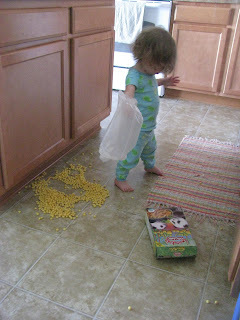 Regarding Teyla dumping the cereal: You can keep her on those days! 1 - For the life of me, i do not understand why we do not have TJ in Texas. Especially Austin. 2 - Teyla is delicious. And I am impressed because her jammies match. 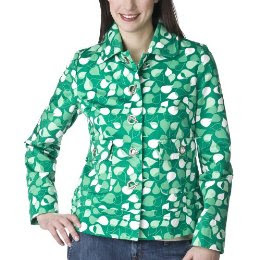 3 - That coat is so you. But you could not wear it down in trader joe-less land now, where we consider 78 degrees a cold front. Oh, I'm SO pining for a local TJs. You already know I go to great lengths to visit my old friends in Hawaiian shirts! Sigh. I think it's time to move. "Milk in the oven..." heheh. Multi tasking is the seed of danger. Danger, I tell you!! The bright side, those close are SUPER clean. 1. I've done that before. And I've also found dish detergent in my fridge. Multi-tasking gone awry indeed. 2. *Big sigh* because living in Colorado deprives me of the quirkiness of TJ's. 3. We looked for the goslings that I've heard were born to our library geese. Couldn't see them yesterday...must have been out on a walk when we stopped by. 4. Most Coloradoans don't have AC. One more reason you should consider living here one day. Just ignore the TJ's bit I mentioned above. 5. 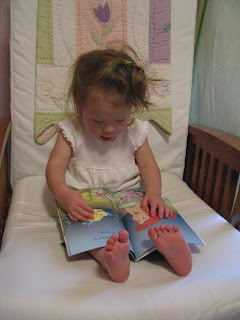 Those toes peeking out from that book made me smile. 6. LOVE that jacket. Makes me 10 shades of happy for you. 7. I need to enter your contest! LOL. OL. @ your laundry story. You know I would so do that. I love your description of TJ's: "like a discount Whole Foods with a surfer attitude". SO true. Love TJ's. AND one is opening a hop skip and big jump from my house!! YIPEEEEEEE. I saw that coat at Target!! LOVE it. This is a fun post. I am so jealous and want a Trader Joe's here! How I love Trader Joe's. For Mother's Day, my very domestic daughter gave me a Trader Joe's Cookbook (available at Barnes & Nobles) in which every ingredient in every recipe comes from TJ's. All that and a Chick-Fil-A withing easy driving distance? Yes, I am truly blessed! May Teyla always love a good book!